The PassCity card gets you museums, coffee, taxi rides, and public transit. Russia has introduced a new tourist pass called PassCity, which will be of use not only to foreign travelers who have come to Russia for a few days, but also to students from overseas and expatriates whose stay extends to a few months and more. PassCity has apps available for Android and iOS with free audio guides in English and Chinese. PassCity has become Russia's first pass which is valid in two cities at once and covers all the major museums of Moscow and St. Petersburg. The price for a tourist pass for 3/5/7/10 days varies from $80 (1 person, 3 days - 5190 rubles) to $230 (2 people, 10 days - 14,390 rubles). A 90/180/360-day pass costs from $64 (1 person, 90 days - 3990 rubles ) to $160 (2 people, 360 days - 9990 rubles). The package for several days was designed for tourists and includes an unlimited number of museum visits per day, as well as public transit. The 3/6/12-month card is meant for temporary residents of the cities and covers one museum visit a day, without access to public transit. Apart from admission to museums, the pass gets you free coffee in the DoubleB chain of coffee shops, several trips on the airport express in Moscow, and subway rides in St. Petersburg or by taxi ordered through the Yandex.Taxi service. 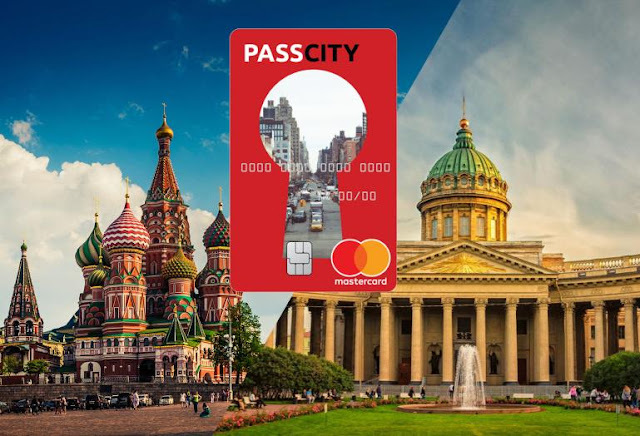 Russian PassCity is as easy to use as a regular credit card: It uses the Mastercard payment system, and the chosen package of services is activated upon purchase. You can deposit money on the card and use it to pay for other goods and services: Using an extra credit card instead of your primary card when traveling is a sensible security measure. Cards are delivered through a system that has recently gained popularity among Internet banks. "You can order the pass online or through the app, and our courier will deliver it where and when you decide, for instance, your hotel, or the railway station where the airport express arrives. Our customers have confirmed that this is a lot more convenient than having to look for a sales office in an unknown city," explains Maksim Ivlev, Voxxter CEO. Voxxter believes the pass could be useful for tourists who come to Russia to watch upcoming sporting events, including the 2018 FIFA World Cup.